Matsuya Nozawa is a gidayu shamisen performer at the National Theatre of Japan, and one of Japan’s Living National Treasures. He will introduce us to the world of joruri, a form of musical narrative which accompanies bunraku and kabuki. Alongside his professional performances, Nozawa has made it his mission to develop wider interest in kabuki, bunraku and joruri by going beyond the usual classical repertoire. Since 2004, he has been performing his own joruri, telling familiar folk tales in everyday Japanese, in schools, kindergartens and community centres. For this event Nozawa will tell the stories of Momotaro, the Japanese hero born from a peach, and Oitekebori, the ghost who lurks in canals haunting unwary fishermen, and will give an account of the legendary duel between General Minamoto no Yoshitsune and the warrior-monk Benkei. Nozawa will also talk about his craft and answer questions on joruri, kabuki and bunraku. Matsuya Nozawa is one of Japan’s Living National Treasures. 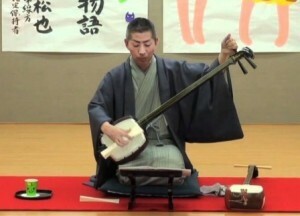 He was born in Hiroshima in 1955 and began playing the shamisen at the age of 14. In 1972 he joined the National Bunraku Theatre as a trainee, making his full debut in 1974. In 1979 he joined the National Theatre of Japan, where he continues to accompany kabuki and teach. One of his most significant contributions to the kabuki repertoire was an adaptation of Shakespeare’s Twelfth Night.